The Paynesville Area Middle School announced its last group of Students of the Month for this school year. 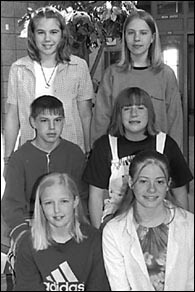 Honored for May are: (top row) sixth graders Courtney Hedtke and Emily Mergen; (middle) seventh graders Cassandra Lounsbury and Andrew Christian; and (front) eighth graders Michelle Monson and Rachel Wendlandt. Teachers select students who show leadership abilities, work hard in class, and are dedicated students. Emily is the daughter of Ron and Michelle Mergen. Her teachers state she is a responsible, hard working student. She is a member of the sixth grade choir. Emily was amazed at being selected Student of the Month. She contributes her good grades to the honor. Courtney is the daughter of John and Mary Hedtke. According to her teachers, she is a good student, responsible, and friendly. Courtney was surprised and happy to receive the honor. She feels hard work was the reason she received the honor. Andrew is the son of Pat and Vonda Christian. Andrew's teachers state he is considerate of others, friendly, and a hard worker. Andrew, who likes to be called A.J., is involved in track, wrestling, and football. "I was shocked to receive the honor," he said. He attributed the honor to his working hard and doing his homework and assignments. Cassandra is the granddaughter of Jo and Bob Lounsbury. Her teachers consider her a hard worker, an over achiever, and a responsible student. Cassandra is a member of the seventh grade volleyball and softball teams and Future Leaders of America. "I was very happy and surprised to be named," Cassandra said. She contributes the honor to handing her assignments in on time and to paying attention in class. Michelle is the daughter of Jeff and Betty Monson. According to her teachers, she is a hard worker and a dedicated student. She is a member of the Paynesville Girl Scouts. Michelle was happy to receive the honor. "I worked hard in classes," she said. Rachel is the daughter of Ken and Kristi Wendlandt. A conscientious student, Rachel's teachers feel she is a hard worker and a dedicated student. Rachel competes on the eighth grade basketball and volleyball teams. "I was surprised to receive the honor," Rachel said. "I worked hard to achieve this honor."